Your wheels are one of the most valuable parts of your car that are also among the easiest to steal. With a wrench, a jack, and a few minutes, thieves can easily nab the wheels right off your car without making a sound. That’s why you need to install a wheel lock for your car. But what are the best car wheel locks? What should you be looking for when you’re browsing to buy a wheel lock? In this article, we’ll examine a handful of the best wheel locks on the market so that you can pick the one which will keep your car safe and secure no matter where it’s parked. What Are The Top Wheel Locks On The Market? How Long Should My Wheel Lock Last? How Do I Know What Kind Of Wheel Lock To Get? How Do I Know That My Wheel Lock Will Prevent Theft? You should be looking for three main things in your wheel locks: security, ease of use, and durability. The security of the wheel lock is a no-brainer. If your wheel lock is easy to break or unlock by someone without the key, your car will be as easy to pilfer as before you attached the lock. The best wheel locks advertise that their locks are made with a high degree of variance. A high degree of variance in the lock makes the lock harder to pick and also gives you more confidence that people with the same lock won’t be able to just unlock it and steal your wheels. Some wheel locks have multiple locking mechanisms. These locking mechanisms generally aren’t necessary for the sake of security because the first lock is enough to ward off most theft. Nonetheless, it may be advantageous to have a second layer of protection. Ease of use is another important feature of your wheel lock. If your wheel locks are too cumbersome to be consistently putting onto your wheels, you are leaving yourself vulnerable. The best wheel locks are very easy to install and remove if you have the key. Typically, this means that the best wheel locks are relatively lightweight. Heavier and more security intensive wheel locks will add a lot more security but you will almost certainly use them less frequently. It is usually a good idea to pick the most secure wheel lock that is easy enough for you to install and remove that it is not a hassle. Wheel locks that can fit in the palm of your hand fit this bill nicely. Finally, wheel locks need to be durable. Your wheel locks will probably not have to endure sustained attempts to crack them open which will cause wear and tear. But they might get left outside in the elements for a long time while you are away. Most wheel locks have protective coatings which stave off the elements. If you live in an area with a lot of snow and salted roads, however, the environment can still be harsh on your wheel lock. Especially if you live in a harsh area you should consider getting a more resilient wheel lock than you might otherwise. 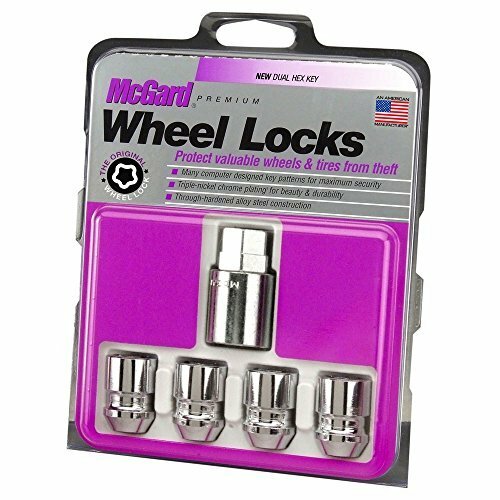 The McGard 24157 Chrome Cone Seat Wheel Locks are a standard set of wheel locks which are ideal for someone who needs a small, compact, and secure locking mechanism for their wheels. McGard is well-known in the wheel lock industry because of their inexpensive yet immaculate wheel locks. These wheel locks are cone seated, and have a 19mm or 21mm hex size. You’ll find that these wheel locks are easy to attach and also easy to disarm. These wheel locks are lightweight, so you won’t have any trouble transporting them or putting them on even if you aren’t very strong. The thread of the lock should work for most types of wheels on common cars and SUVs. 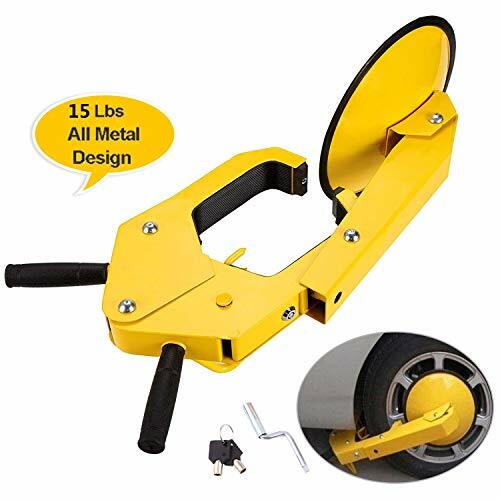 If you are looking for a wheel lock for a semi truck or other kind of large commercial vehicle, this wheel lock will likely be too small. This set of wheel locks is very durable owing to its triple-nickel chrome plating. You shouldn’t notice any corrosion or scratch even after extensive usage. Thanks to the way that these wheel locks were manufactured, the hardness of the lock is uniform. This means that even if a thief manages to chip the lock, they’ll have a lot more chipping to do before the lock breaks. 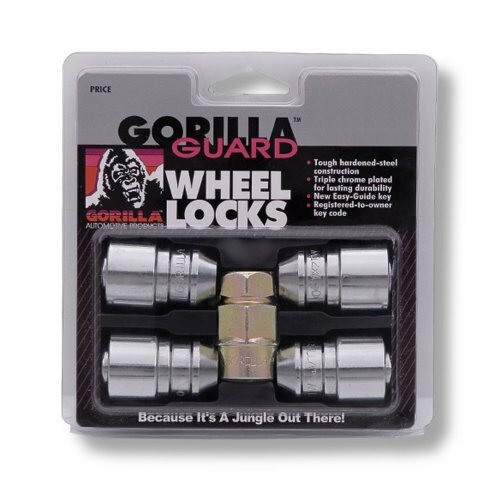 The Gorilla Automotive 61641 Acorn Gorilla Guard Locks are conical style wheel locks with a 14mm thread size. The Gorilla Automotive wheel locks have a bit of extra durability which is derived from their conical structure. Conical wheel locks tend to be slightly harder to install, however. Nonetheless, the Gorilla Automotive wheel locks have a variety of different sizes and lengths. You’ll be able to find a wheel lock in their lineup regardless of the kind of car you have. The need to customize the wheel lock to the wheel makes it a bit more of a hassle to set up than other wheel locks, however. On the other hand, Gorilla Automotive will register your locks to your vehicle and your identity. This means that if the car is somehow still stolen, the wheels will be useless and unsalable. The added peace of mind is probably the biggest benefit of the feature, however. Even if you lose the key to your wheel locks, you’ll be able to get the company to replace it quickly. 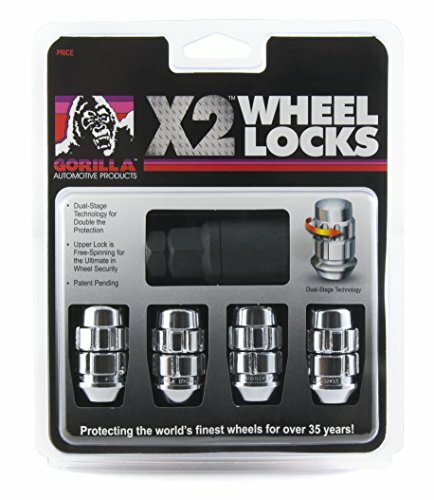 The Gorilla Automotive 71641X 14mm x 1.50 Thread Size Acorn Chrome X2 Wheel Lock is an even more secure version of the powerful Gorilla Automotive wheel lock line. The Chrome X2 is a big improvement on the other Gorilla Automotive wheel lock which we’ve reviewed today. The Chrome X2 contains a double-locking mechanism which is linked both to a key and to a specialized wrench. This means it is twice as unlikely to be broken or picked. The metal is also a higher quality in the Chrome X2. As the name implies, the wheel lock is chrome plated, which makes them aesthetically appealing and also guards against staining. Underneath the chrome plating is solid steel. These wheel locks are also easier to install than their siblings despite added security. You may find it slightly inconvenient to use the dedicated hex key on these wheel locks, but the added safety is well worth the trouble. The McGard 24538 Chrome Cone Seat Wheel Locks are compact and easy to install conical wheel locks which derive their security value through the many possible configurations of the lock block. The McGard 24538 is made of triple-plated chrome laid over steel. Notably, it is 0.04 inches shorter than most standard wheel locks which are 1.5 inches in length. This extra wiggle room is unlikely to be noticeable, but in some cases of awkwardly shaped wheels, it might make the difference. These locks aren’t particularly heavy duty nor are they particularly easy to install. Nonetheless, as one of the most loved wheel locks on the market, this set of wheel locks is more than sufficient to protect your car. The COOCHEER Heavy-duty Car Tire Wheel Lock Anti-theft Lock is a very heavy duty wheel lock which aims to protect your entire car from being stolen rather than any single wheel. Thanks to its massive yellow boot format, this wheel lock is a great theft deterrent. There’s no way that anyone is going to remove this wheel lock without spending a good amount of time working with specialized power tools. You can rest assured that your car isn’t going to get stolen while using this wheel lock. Your other three wheels might get stolen, however. Because of how large and cumbersome this massive wheel lock is, it’s extremely unlikely that you’ll have the patience to set up four of them. Nonetheless, these wheel locks are the most heavy duty that exists. You can use these wheel locks for years without fear of them rusting or breaking. The yellow paint may discolor eventually, but the steel of the wheel lock itself will still be strong. This wheel lock is compatible for most larger wheels. You can use it on your SUV, RV, ATV, trailer, or large-wheeled car. For compact wheels, you should probably find a smaller wheel lock because this one is too big. The cumbersome nature of this wheel lock is its biggest downfall. The key snaps it into position promptly, but you’ll have to keep the unit in your trunk where it will take up a lot of space. Then, you’ll need to heft it onto the wheel and spend some time setting it up. This makes the wheel lock best for longer periods of time rather than overnight stints. Your wheel locks should last you the lifetime of your car. There is a chance that if you leave your wheel locks out in a harsh environment they will discolor and begin to rust. It typically takes a very long time for a wheel lock to rust totally, however. If someone tries to break your wheel lock, you may want to purchase a new one to be safe. Wheel locks have many different types, sizes, and threadings. The threading is determined by the type of wheel your car has. You can look up the proper threading for the type of wheel using the information in your car’s manual. The size of the wheel lock is a matter of personal preference. It’s entirely possible to lock a massive semi truck wheel with a tiny lock if you prefer. The tradeoff is that larger locks typically have larger deterrent value and often more security value too. The size of the wheel lock also influences how easy it is to set up and then remove later. You should be conservative with your wheel lock size choice. The type of wheel lock is also a matter of personal preference. Conical locks are mildly more secure than other small lock styles. All small lock styles are less secure than the large boot style locks. You can easily figure out if your wheel lock will prevent theft with a test of your own. Lock your wheel lock to your car, then try to remove it without unlocking it. You will find that the wheel lock has no give in any direction provided that it has been locked correctly. You can then try to remove the wheel lock with whatever kind of tools you think a robber would have. In all probability, you will not be able to remove the wheel lock. While there is no guarantee that wheel locks that meet this specification will prevent all robberies, there is a good chance that if you cannot remove your own wheel lock when you try a robber will be similarly incapable. Finally, another way to think about your wheel lock’s security value is in its deterrent value. Large and aggressive wheel locks look like they’d be more of a pain to try to remove than the wheel would be worth. On the other hand, small and unobtrusive wheel locks may be an invitation to try to steal your wheels anyway. If you do end up picking a small or sneaky wheel lock, make sure that it can stand up to some targeted attempts to break in.